If you’ve been following us, you may have noticed that we recently did a blog on Punjabi wedding rituals and customs. 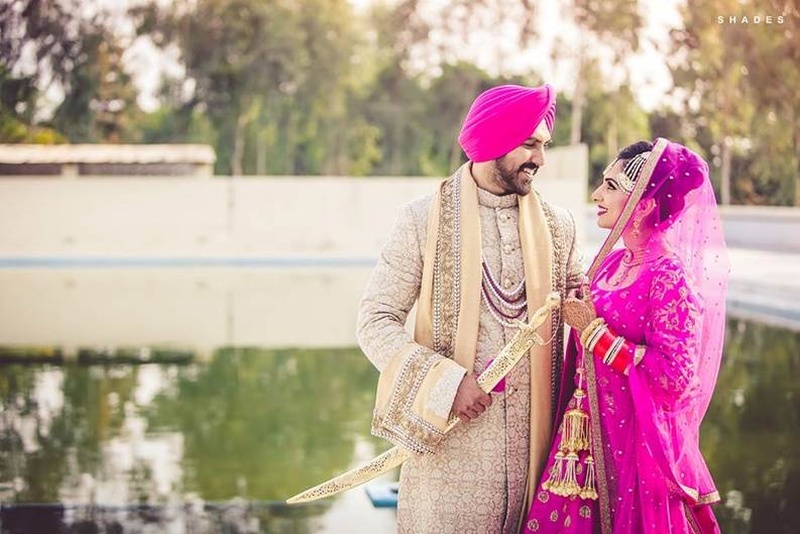 This time, we bring to you Sikh wedding rituals and customs. Let’s start off with the fact that they are not the same, though people tend to regard them as so. Sikh is a religion while Punjabis hail from the state of Punjab. As Sikhism originated in Punjab, it only makes sense that most Sikhs are Punjabi and speak the Punjabi language. Punjabis as well are found all over the country and do not necessarily have to be Sikh. The Sikh wedding event starts off with a Kurmai or engagement ceremony. Akhand paath: The families start off the Sikh wedding rituals and ceremonies by reading the whole Guru Granth Sahib. After this, the wedding date is fixed. After all these rituals, both families gift present each other with gifts. The bride and groom exchange rings. After the engagement, the groom’s family visits the bride and his mother symbolically covers the bride’s head with a chunni. His family also gifts the bride with clothes, jewellery, etc. Mehndi and chooda ceremonies are often done together. Mehndi is when the bride gets her hands and feet decorated in beautiful henna/mehndi designs. For the chooda ceremony, the bride’s maternal uncle gifts the bride with a set of red and white bangles that are to be dipped in milk before presenting. Golden ornaments called Kalires are tied to the bangles. Similar to the Christian bouquet toss, it is said that whichever bridesmaid the bride showers with her Kalire will be the one to get married next. A Sikh wedding ritual where the bride and groom are not allowed to leave their respective houses before the day of the wedding. Gana is another Sikh ritual where a red thread is tied to the bride’s left and groom’s right hand. It is said to be sacred and protect them from bad omens. This is similar to the Hindu Haldi ceremony. A paste of turmeric powder and mustard oil is applied to the bride and groom before the wedding for a natural glow. In this Sikh wedding ritual, holy water is brought from the Gurudwara and the bride and groom are to bathe with this water. The water is to be brought by the sisters-in-law of the couple in an earthen pot (gharoli). After the groom is dressed in his wedding attire, he proceeds to the wedding venue. He is accompanied by his wedding procession consisting of close friends and family members who dance and sing along the way to the venue. This is a Sikh wedding ritual where the bride’s family welcomes the groom as he reaches the wedding venue. They offer the groom gifts and money. Often, they exchange garlands. This refers to the main Sikh wedding ceremony. Anand Karaj translates to ‘blissful union’. The families go into the Gurudwara to attend the Kirtan which is a set of religious songs that are sung. A guru granth sahib, the holy book of the Sikhs is brought out and the priest at the Gurudwara then recites ardas (a set of prayers) while the bride and groom are seated. Laavan are the four prayers that seal the marriage. The bride’s pallu and the groom’s shawl/dupatta are tied together as a symbol of unity. They then take rounds around their holy book, the guru granth sahib as the laavan is chanted. The groom leads the rounds holding a Kirpan (sword). They exchange garlands and are then considered married. A ceremonial sweet is offered to the guests. The sweet is either made by the bride’s family or by the gurudwara in a certain method and is blessed and considered holy. An event that takes place to celebrate the newly married couple and their married life in the future. Food and drink is served and a lot of entertainment takes place. This is when the bride bids an emotional farewell to her family and proceeds to her husband’s house. As she departs, she throws a handful of rice backwards towards her mother, symbolically thanking her family for bringing her up and trying to repay them. It is called doli as in earlier times, the bride was carried to the groom’s house in a wooden structure called doli. When the couple visits the bride’s house for the first time after the wedding, they receive a warm welcome with gifts and an elaborate meal.